To ensure a great-looking, long-lasting tile job, get this all-important mortar blended just right. Grout—the putty-like filler between tiles that keeps them sealed, solid, and set in place—tends to be an afterthought. But homeowners have reason to prioritize this DIY job: When this filler is not clean, smooth, and uniform, it detracts from the overall look of your finished tile project. Fortunately, the key to good grout lines lies in mixing grout correctly so that it spreads on with ease and produces even lines between tiles for a perfect finishing touch. First, note that grout comes in two varieties; you must choose between sanded or un-sanded grout. If the joints between the tiles are under ⅛”-thick, un-sanded grout is will be easier to use and give better adhesion in those narrow spaces. For thicker joints of ⅛- to ½”-thick, go with sanded grout for best bonding and less shrinkage. Also, bear in mind that many tiling pros favor grout with a polymer additive, claiming it helps grout dry to an even harder final product and resist staining. For bathrooms, consider grout that includes a fungicide to help resist mold growth. Once you have chosen the right grout for your project, you’re ready to mix. The process boils down to five key steps. Add water to grouting powder in manufacturer-recommend ratio. Tilt mixing bucket and stir with grout-mixing knife. Adjust grout consistency by adding more powder or water. Let grout rest (slake) for up to 10 minutes. Use grout knife to mix thoroughly once more. For full instructions on how to mix grout, read on! STEP 1: Add water to grouting powder per manufacturer’s instructions. 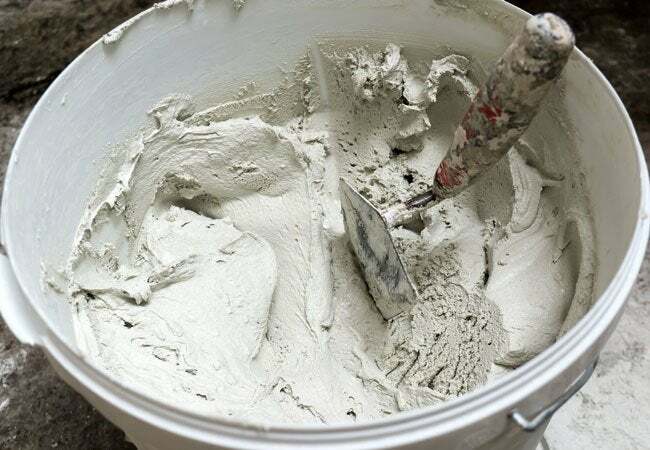 Pour about a quarter or half of the grouting powder into the bucket—you’ll want extra available in case you get the water-to-powder ratio wrong in the mixing phase. Refer to the manufacturer’s mixing directions for how much water to add, using a fraction less water than recommended; you can always add more later. Look at preparing grout as similar to making cake batter, in that recipe amounts can change depending on humidity. Tip: Avoid mixing grout with well water or hard water, minerals from which can cause efflorescence, an unattractive white residue, as moisture seeps into the grout. If you’ve got a well or hard water in your area, use distilled to mixing. STEP 2: Tilt mixing bucket and stir with grout-mixing knife. Turn the bucket onto about a 45-degree angle so it’s easier to see the contents and mix thoroughly. Add water (remember, less is more—cautiously increase the water content as needed) and stir with the grout-mixing knife or small trowel. Continue mixing until all the powder is blended, making sure to remove all lumps. Tip: Resist the temptation to use a corded drill with a paddle attachment to mix grout. Automated mixing can introduce too many air bubbles, weakening the grout and potentially causing discoloration. STEP 3: Adjust grout consistency by adding powder or water. Check the grout’s consistency. Ideally, it should resemble creamy peanut butter—not that oily all-natural peanut butter, but the super-emulsified commercial kind that a knife can stand up in. Some tiling pros describe the perfect consistency as being akin to soft bread dough, where you can grab a handful and it maintains its shape, and, if squeezed slightly, shouldn’t leak water. If grout is too slack or liquid-y, or has a cake icing consistency, add some more powder and mix well. Left too thin, it’ll shrink too much after it’s applied and crack. Good grout will need a little elbow grease to push into the tiles. If grout is too dry and clumpy, moisten the sponge with water and squeeze just a dribble of water into the grout mix. Do this in gradual additions until achieving the right peanut-butter texture. STEP 4: Let grout rest (slake) for up to 10 minutes. Allow the grout to “slake,” the term for letting it rest for five to 10 minutes so that the chemicals can bond. During slaking, moisture fully permeates all the powder; without proper slaking, grout will be weaker and more prone to cracking and chipping. Don’t worry—and don’t add water—if the grout seems a bit thicker after a maximum of 10 minutes. STEP 5: Use grout knife to mix thoroughly once more. Mix your batch of grout thoroughly one more time, and get busy applying it to complete your DIY tile job.